The Secret To A Healthy Microbiome Could Be Hidden In The Diet Of Africa's Hadza Tribe : Goats and Soda Some species of bacteria in our intestines are disappearing. Can we reverse the microbial die-off? The food eaten by Tanzania's Hadza tribe could hold the answer. Hadza man eating honeycomb and larvae from a beehive. Yes, I'm talking about the microbiome — that collection of bacteria in our intestines that influences everything from metabolism and the immune system to moods and behavior. "Over time we are losing valuable members of our community," says Justin Sonnenburg, a microbiologist at Stanford University, who has been studying the microbiome for more than a decade. "They are a very special group of people," Sonnenburg says. "There are only about 2,200 left and really only about 200 that exclusively adhere to hunting and gathering." The trend was clear: The further away people's diets are from a Western diet, the greater the variety of microbes they tend to have in their guts. And that includes bacteria that are missing from American guts. "So whether it's people in Africa, Papua New Guinea or South America, communities that live a traditional lifestyle have common gut microbes — ones that we all lack in the industrialized world," Sonnenburg says. That's the conclusion Sonnenburg and his team reached after analyzing the Hadza microbiome at one stage of the yearlong study. But when they checked several months later, they uncovered a surprising twist: The composition of the microbiome fluctuated over time, depending on the season and what people were eating. And at one point, the composition started to look surprisingly similar to that of Westerners' microbiome. During the dry season, Hadza eat a lot of more meat — kind of like Westerners do. And their microbiome shifted as their diet changed. Some of the bacterial species that had been prevalent disappeared to undetectable levels, similar to what's been observed in Westerners' guts. 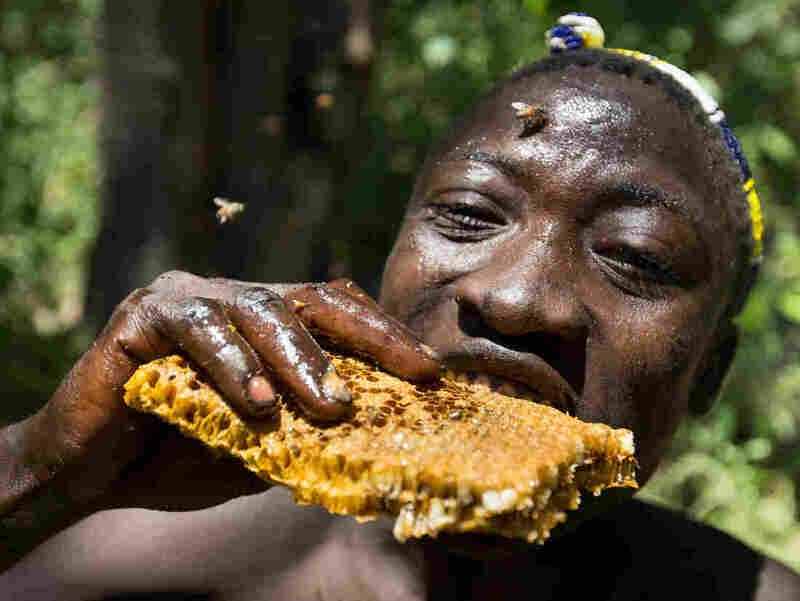 But then in wet season — when Hadza eat more berries and honey — these missing microbes returned, although the researchers are not really sure what's in these foods that bring the microbes back. "I think this finding is really exciting," says Lawrence David, who studies the microbiome at Duke University. "It suggests the shifts in the microbiome seen in industrialized nations might not be permanent — that they might be reversible by changes in people's diets. "The finding supports the idea that the microbiome is plastic, depending on diet," David adds. Now the big question is: What's the key dietary change that could bring the missing microbes back? Lawrence thinks it could be cutting down on fat. "At a high level, it sounds like that," he says, "because what changed in the Hadza's diet was whether or not they were hunting versus foraging for berries or honey," he says. "We're beginning to realize that people who eat more dietary fiber are actually feeding their gut microbiome," Sonnenburg says. Hadza consume a huge amount of fiber because throughout the year, they eat fiber-rich tubers and fruit from baobab trees. These staples give them about 100 to 150 grams of fiber each day. That's equivalent to the fiber in 50 bowls of Cheerios — and 10 times more than many Americans eat. "Over the past few years, we've come to realize how important this gut community is for our health, and yet we're eating a low-fiber diet that totally neglects them," he says. "So we're essentially starving our microbial selves."